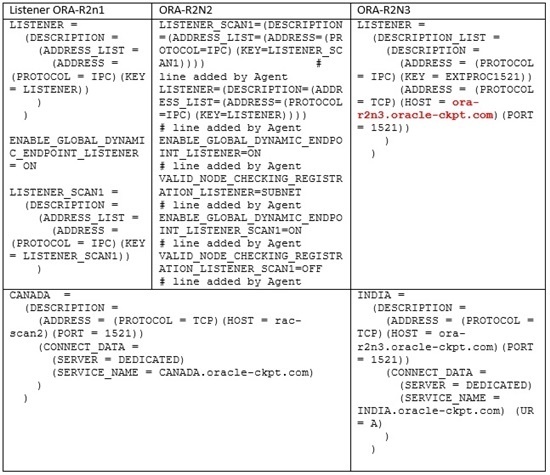 This article explains how to configure Data Guard between RAC primary and standby alone (Oracle restart) Standby database with easy and all advanced methods to achieve Oracle maximum availability architecture with the Data Guard broker and finally how to register the database with high availability services to manage database using service control utility. This article is purely for 12c and of course the procedure is applicable for even earlier versions and release but with few changes in compatibility parameter. We have seen MAA documents with earlier versions but the data guard configuration is with manual method. In this article we have used all advanced and available methods to build Standby from RAC to stand alone. As we know there are various methods to refresh standby from primary and the preference of the method is purely dependent on the downtime, network transfer rate, space constraints and so on. In this article we have used the Active Duplicate method to refresh the database for standby use and configured Data Guard using broker with easy steps. Basically this article goal is to show how simple is to configure the setup. Usually there will be lot of confusion in Data Guard parameters when the RAC is primary and standby is Stand alone. So to lift out these confusions I will strongly recommend using Broker to simplify the setup and to avoid misconfiguration of the setup. Now question is my customer is not preferring the Data Guard broker, but being DBA its his/her role to explain the things how the Data Guard broker ease the things and how beautiful features introduced in 12c like we can forecast whether the switchover WILL be successful or not and to validate the configuration between primary and standby so on. Before the configuration first let’s understand the proposed configuration and rough architecture. 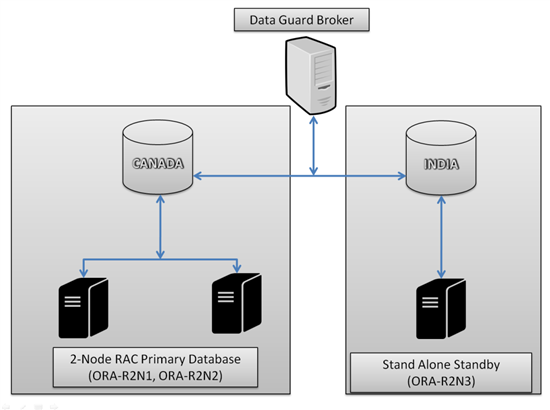 As said earlier the primary is RAC database with server ORA-R2N1 and ORA-R2N2 and the standby stand alone database hostname is ORA-R2N3 and the Data Guard will be managed using the Data Guard Broker. Apart from that the configuration and the steps are same for any Operating system except few things in copying files and using the commands. We have to be very careful before creating standby database and the mandatory of them are below one by one. The very important thing is the primary database should be in archive log mode and whether you use FRA or not it is optional but highly recommended to fulfill the MAA concept, so that oracle will manage archive log files, backups and flash logs based on the space considerations. 1. Archivelog mode – Indeed production database will be in archivelog mode, if you are using for any test purpose then you can enable archiving from the mount status using the command “alter database archivelog” and then open the database. 2. Force Logging – Few of the tables/objects might be created in nologging to stop the heavy redo generation, but with this behavior standby will not function, Hence ensure the primary database is in force logging mode to ensure all the changes have redo for standby availability to recover the changes. 3. Standby Logfile Groups – This is the best practice to create the standby log files on primary so that in the duplicate process the standby log files will be created automatically same as primary if we specify valid LOG_FILE_NAME_CONVERT values. If we do not create the standby log file groups on primary then we can also again create on standby after the duplicate or restore. Ensure the standby log file size is same as the online log file size and the number of standby log filegroups is same as online log file groups. 4. Listener & Oracle net service – As we know from 11gR2 we have concept of scan listener for more flexibility on load balancing and no more risk in case of add/delete nodes so on. So review the primary and standby listeners and the net services we have defined. For RAC we are suing scan ip and where for standby we are using regular IP address. 5. Initialization parameters - Prior to diag destination introduction we have to create many directories to store adump,bdump, udump , cdump so on. Now our job is so easy and if we want explicitly want to have different location then of course we can assign like adump I have defined in below init configuration. This article is purely for 12c so do not forget about multitenant , if the primary database contains pluggable database then we must add parameter enable_pluggable_database=true. We can also skip adding PDB database but it DOES NOT MEET MAA. If you take a look my primary database disk group names are different and for standby disk groups are different, hence I have used DB_FILE_NAME_CONVERT and LOG_FILE_NAME_CONVERT for online and standby log files. 6. Password file – For RAC primary database we have password file in shared location from 12c and not in local locations, Now copy the password file from primary to standby host and we can place in local location because there are no other instances to use the password file. 7. Startup the Instance – Now we have in place of the init file and oracle net service, password file. Start the instance in nomount status after creating directory of adump to store audit files. Copyright (c) 1982, 2013, Oracle and/or its affiliates. All rights reserved. 9. Script to create Standby – When managing the big tier databases and of course it is time taking to complete duplicate, so ensure to run the duplicate with script to run in background. 11. Check Standby Database status – After the successful duplicate of database, we can see that standby database is created and it’s in mount status. 12. Configure Oracle Restart for standby – The deployed database is normal database, now we have to attach to the Oracle restart so that we can manage database using srvctl, below is the procedure to do. The standby instance must use the SPFILE in order to configure Data Guard broker and hence first we will create pfile from the spfile which was created during Duplicate and then we create spfile in ASM from the local pfile. Now the database is started with spfile which located in ASM. Next add the database to the oracle restart. After adding database to the configuration, we can manage database using srvctl to stop and start. 13. Configure Data Guard – Surprised why we are using broker without configuring any Data Guard parameters in SPFILE? Yes that is true, we are going to use the advanced method and simplified method to avoid misconfiguration to the Data Guard. Enable the data guard broker using the dg_broker_start to TRUE. Configure the Data Guard configuration files to create under the ASM disk group, because there will be common configuration files for the RAC node 1 and Node 2. The whole Data Guard configuration is only three commands to create configuration, adding standby database and enabling the configuration like below. 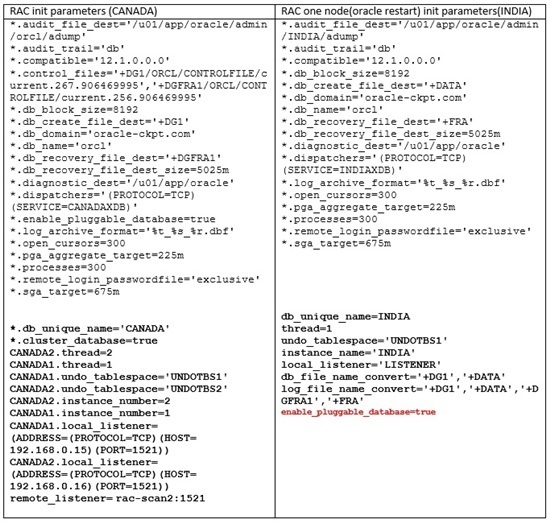 Configuration "haconfig" created with primary database "canada"
2016-03-15 22:31:05.293 dg_broker_config_file1 = "+DG1/ORCL/dr1CANADA.dat"
2016-03-15 22:31:05.294 dg_broker_config_file2 = "+DGFRA1/ORCL/dr2CANADA.dat"
We’ve seen the step by step procedure for “MAA – Creating Single instance Physical Standby for a RAC primary - 12c” using the simple steps to achieve flexible architecture and how easy to configure Data Guard using broker which is highly recommended with advanced methods to achieve such configuration.